Getty ImagesUS presidential candidates Donald Trump and Hillary Clinton during the second TV debate. 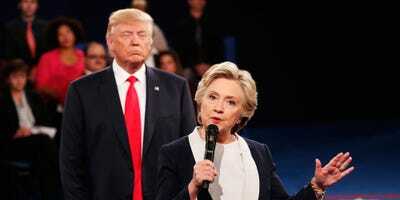 President Donald Trump appeared to gloat about using Cambridge Analytica to beat Hillary Clinton in the 2016 US presidential election on Twitter on Thursday. The British firm is embattled after harvesting the data of 50 million Facebook accounts and boasting about its ability to covertly target voters and entrap politicians. President Donald Trump appeared to gloat about using Cambridge Analytica, the embattled data analysis firm at the center of scandals in the political and tech world, to beat Hillary Clinton in the 2016 US presidential election. “Remember when they were saying, during the campaign, that Donald Trump is giving great speeches and drawing big crowds, but he is spending much less money and not using social media as well as Crooked Hillary’s large and highly sophisticated staff. Well, not saying that anymore!” Trump tweeted on Thursday, in what appears to be his first remark on the scandal. The firm exploited Facebook’s data rules to vacuum up data from some 50 million Facebook users in 2014 as part of an operation to seed attack ads on the internet during the 2016 US election. Clinton herself questioned if Cambridge Analytica helped Russian agents influence the election by targeting Facebook ads to voters in Michigan, Pennsylvania, and Wisconsin in an interview with Britain’s Channel 4 News, but Trump visited those battleground states more than Clinton did. In more than 100 days since the Democratic National Committee announced Clinton as the candidate to the date of the election, she never once visited Wisconsin. Clinton attended about seven times as many fundraisers as Trump did during the campaign, and raised roughly twice what he did. Trump’s 2016 win by fewer than 90,000 votes remains the biggest political upset in modern US history.